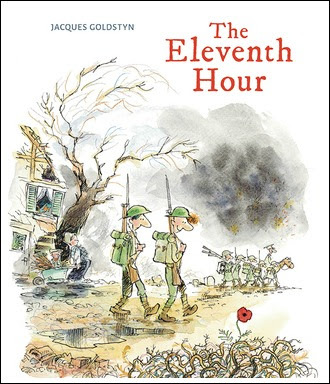 Since the last book I reviewed here was a WWI story, I thought it would be a good time to look at The Eleventh Hour, a WWI picture book for older readers (7+). It is the story of two friends who ultimately find themselves on the battlefield, and give the poppy on the cover, I assume they fought on Flanders Field. Jules and Jim are born in the same town on the same day in a small Canadian town. Jim is born first, followed by Jules two minutes later, setting a life long pattern of Jim being on time, Jules being late. Because they are next door neighbors, the boys play with each other as babies, and become childhood best friends. They like to do the same things, but it is always clear that Jim is the leader: '...Jim always took the lead. He was faster and stronger than Jules, but since they were friends, Jim always looked out for Jules. Everyone agreed: Jules and Jim were an odd pair." The two remain best friends as they grow up and when Britain and Germany go to war in 1914, Canada also goes to war (at the time, Canada was a British dominion). Both Jim and Jules enlist in the army. And just like always, Jules is a little behind Jim, who gets the best fitting uniform, does better in basic training and sails to Europe in a big new convoy ship. Showing up two minutes late, Jules ends up in an ill fitting uniform, spends basic training peeling potatoes, and misses sailing to Europe in the same ship as his best friend. War isn't exactly what they expected, but they do their duty in the trenches, fighting the Germans, the wet cold, the lice, and the rats in the trenches and obeying orders. Jules and Jim never really understood the war and even envy prisoners, for whom the war is over. The war gets much worse before it gets better, but finally, on November 11, 1918, an armistice is signed and the cease fire is scheduled to happen at 11 o'clock that morning. At 10:58 AM, following an order to attack, Jim is killed on the battlefield and Jules is devastated. Jules returns home without his best friend, and tries to live a normal life, but can't stop thinking about Jim. After trying all kinds of jobs, Jules becomes a watchmaker, and although his watches work well, they nevertheless always run two minutes behind. Originally written in French (Jules et Jim: frères d'armes) and skillfully translated by Anne Louise Mahoney, who never loses the wry humor or the poignancy of the story, The Eleventh Hours is an incredibly sad book. Each time I've read it, it brings tears to my eyes, but it is also an incredibly powerful anti-war story. It is based on a true story and dedicated to the memory of George Lawrence Price, the last Canadian to die in WWI, when he was killed at 10:58 AM, just two minutes before WWI ended. Goldstyn is a political cartoonist and is quite adapt at creating a strong story with one illustration. And The Eleventh Hour is not different. Despite the economy of words and spare line and watercolor illustrations, Goldstyn nevertheless paints a full picture of more than a life long friendship, and life in the trenches, he also manages to include what life was life on the home front, giving a well rounded picture of how war impacted life during WWI, and from which one can easily extrapolate that these tragedies and hardships are same realities of war in general. The Eleventh Hour is a book that will appeal to historical fiction fans, those interested in WWI history, and definitely to pacifists like myself.